It's Superman's 80th birthday, and in the wake of his landmark 1000th issue, Diamond Select Toys is offering this commemorative 2-pack of DC Vinimates vinyl figures! 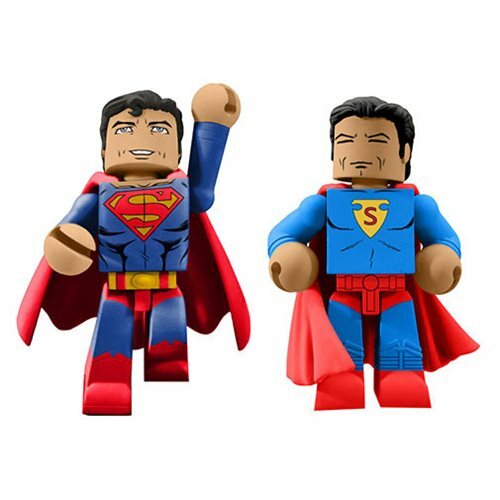 Based on his first appearance and modern-day look, these two 4-inch tall vinyl figures are sculpted in the block-figure style and strike trademark Superman poses. Limited to only 1,500 pieces, this DC Comics 80th Anniversary Superman Vinimate 2-Pack - SDCC 2018 Previews Exclusive comes packaged in a full-color window box.